(Dubai) – His Highness Sheikh Mohammed bin Rashid Al Maktoum, the Vice President, Prime Minister and Ruler of Dubai, said that sending the first Emirati astronaut to space will herald the beginning of a new era for the UAE and represents another step towards achieving the country’s vision and aspirations in the space sector. His Highness’s comment came as the UAE, represented by the Mohammed Bin Rashid Space Centre, MBRSC, and The Russian Federal Space Agency, Roscosmos, signed a cooperation agreement to send the first Emirati astronaut to space to participate in scientific research as part of the Russian space mission to the International Space Station, ISS, aboard the Soyuz-MS spacecraft. Yousuf Hamad Al Shaibani, Director General of MBRSC, and Sergey Krikalev, Executive Director of Manned Spaceflight Programmes at Roscosmos, signed the agreement on the sidelines of UNISPACE +50, a symposium and special high-level meeting of the Committee on the Peaceful Uses of Outer Space, COPUOS, being held in Vienna from June18th to 22nd. “The UAE has signed a historic agreement to send the first Emirati astronaut to the International Space Station. The journey that we began 12 years ago is beginning to bear fruit,” Sheikh Mohammed said. “Our vision to develop the national space sector is being realised with the development of a spacecraft, the construction of our first local satellite manufacturing facility, the training being given to Emirati astronauts, and the launch of a comprehensive scientific and research programme. We will celebrate the 50th anniversary of the UAE in 2021, and we will gift these accomplishments to our future generations so that their dreams will always start from the sky,” Sheikh Mohammed added. His Highness also said that the agreement supports the objectives of the ‘UAE Centennial 2071’ that focus on the development of futuristic sciences across various sectors including innovation, space, engineering and medicine. He also said that the agreement provides an impetus for advancing the UAE’s future space ambitions which include building the first inhabitable human settlement in Mars as part of the 2117 Mars project. H.H. Sheikh Hamdan bin Mohammed bin Rashid Al Maktoum, Crown Prince of Dubai and Chairman of Dubai Executive Council, Chairman of the MBRSC and General Supervisor of all of the Centre’s projects and strategic and development plans, said that the agreement is part of the strategic objective of the MBRSC to advance the UAE’s position as a leading country in the space industry and its efforts to collaborate with major space institutions worldwide to exchange knowledge and best practices in this arena. Sheikh Hamdan said that the first Emirati astronaut will travel to space within a year after the UAE Astronaut Programme creating a final shortlist of candidates under the National Space Programme. Four candidates will be selected from the 95 shortlisted applicants, 75 of whom are males and 20 females aged between 23 to 48 years. Hamad Obaid Al Mansouri, Chairman of the Board of Directors of MBRSC, said that the agreement is part of centre’s strategy to prepare the younger generation for facing future challenges brought by technological development. “Selecting and training Emirati astronauts is crucial to the success of the UAE Space Programme. The selected astronauts will participate in scientific research programmes that will serve humanity and help develop the UAE space sector in the future,” Al Mansouri said. 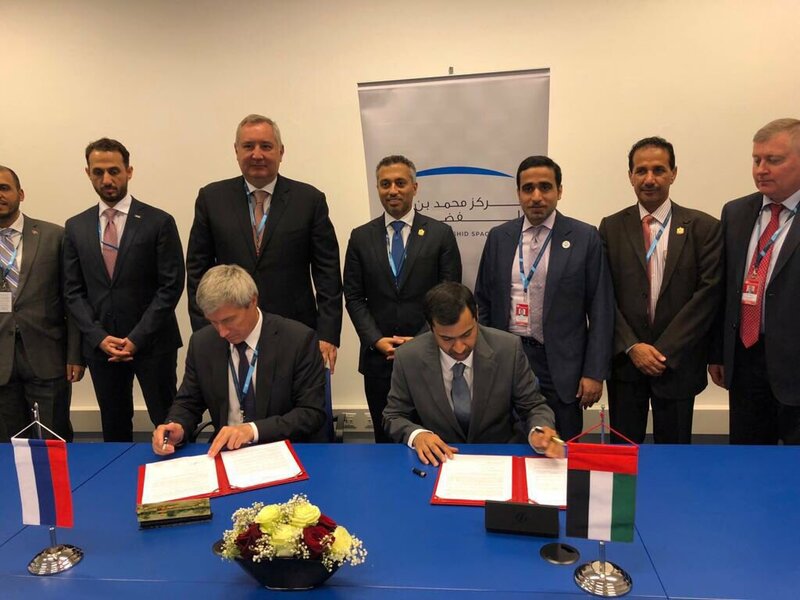 The event was attended by Dr. Ahmed Belhoul Al Falasi, Minister of State for Higher Education and Advanced Skills and Chairman of the UAE Space Agency, Dmitry Rogozin, General Director of Roscosmos State Corporation for Space Activities, and a number of senior officials from both sides.